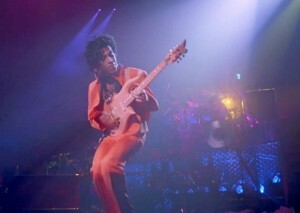 What I remember most about the experience of seeing Prince’s Sign o’ the Times, his 1987 concert film, is that: 1) Not the least of his talents was the ability to twirl in heels more seductively than anyone since Rita Hayworth. And : 2) That the film was impossible to sit through — as in I wanted to toss my notebook, stand up and dance. Most likely because of music-clearance problems, the film is not available on DVD in the United States. For those Prince completists who’d like to see it again, here, to the best of my memory, is a reconstruction of my experience. What I loved best about Prince was his ability to reconcile musical and emotional and sexual and spiritual contradictions. You? Favorite among his movies and his songs?